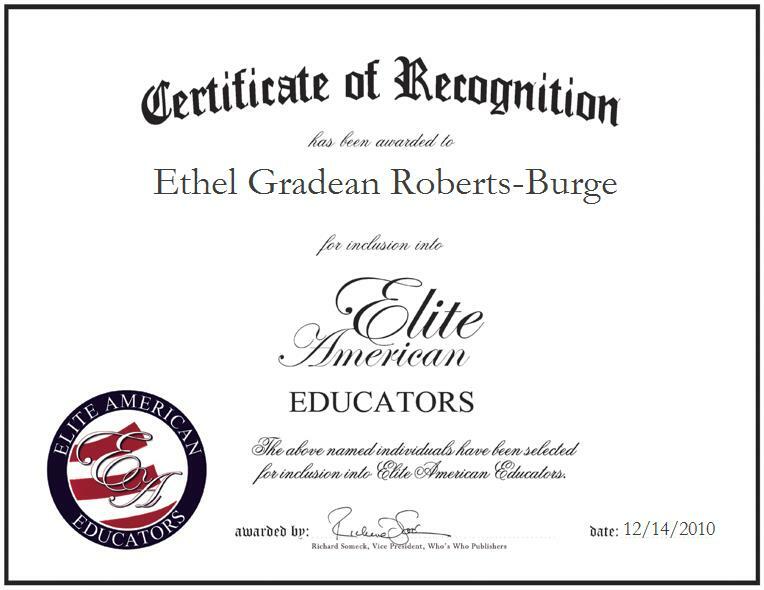 Lake Havasu City, Arkansas | December 14, 2010 | Ethel Burge, Retired Teacher from South Conway County School District, has been recognized by Elite American Educators for dedication, achievements and leadership in education. Ms. Burge grew up in Eunice, a small town in southeastern New Mexico. She has been working in the education field for over twenty five years. After receiving a master’s degree in early childhood education from the University of Central Arkansas and a Bachelor of Science in elementary education from Eastern New Mexico University, Ms. Burge went on to work at South Conway County School District. Here, she became a great educator that specialized in teaching reading. Ms. Burge has been recognized by the New Mexico Education Association and Arkansas Education Association. She also is part of the National Honor Society. Although her accomplishments are bountiful, she feels that her passion for education is a unique accomplishment that sets her apart from others in the field. She knew from a very young age that she wanted to become an educator. She attributes her success to this, as well as her education and her mentors. As an expert in her field, Ms. Burge urges other educators to be patient. She feels that in order to succeed as a teacher, you cannot simply sit behind a desk; you must interact with the children and make sure that they participate.